I just wrapped up my first gift swap and I can now say, it wasn't nearly as scary or stressful as I thought it would be. I've always been pretty intimidated by all the online swaps, scared that my partner wouldn't like what I sent. But Amy talked me into her Twitter Secret Santa Swap, basically because it was a $15 limit and everyone wasn't required to include a handmade item. I received Cajame Creations for my partner. It was fun because we don't have the exact same style, so I was pushed to do a bit of research (ahem - blog stalking) to see what she would like. 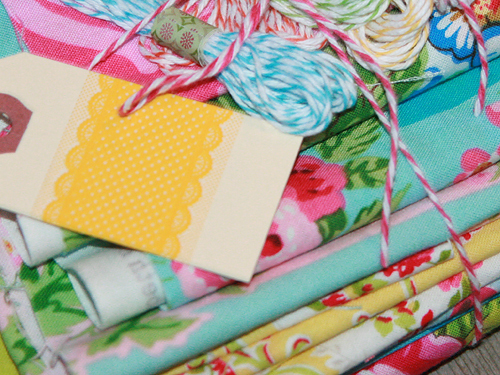 Since our price limit was low and I wanted to get a lot of bang for my buck, I headed to Etsy to find a fabric scrap pack. 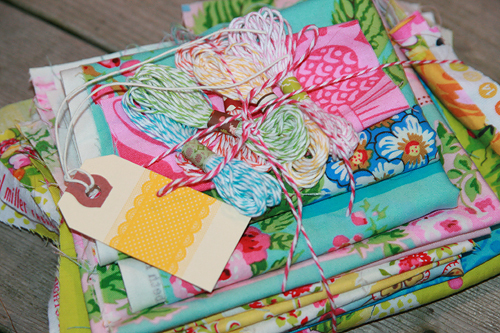 I knew she liked shabby chic and bright colors, and I found a great set of Jennifer Paganelli and Paula Prass fabric. I also included a few colors of baker's twine, because, well come on, you can't have enough baker's twine! She also had recently posted about her "bucket list" and one of the items was buying a camper and traveling across Europe. 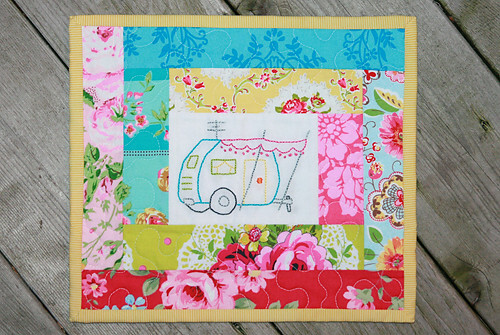 So, I decided to make her a little mini quilt to (one day) decorate the dream camper. 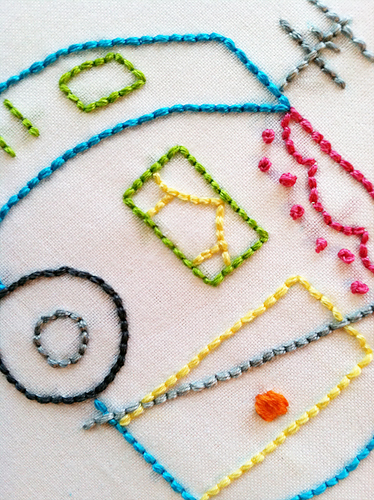 This embroidery pattern is from Sublime Stitching. 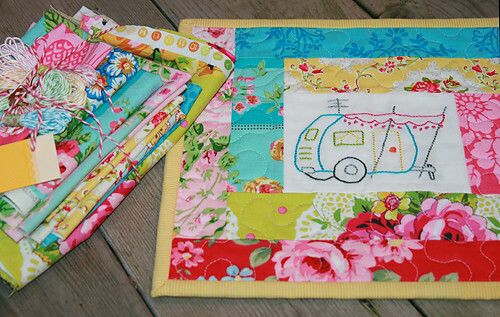 I used some of the fabric scraps I bought her for the mini as well. The secret partner who had me was Amber! 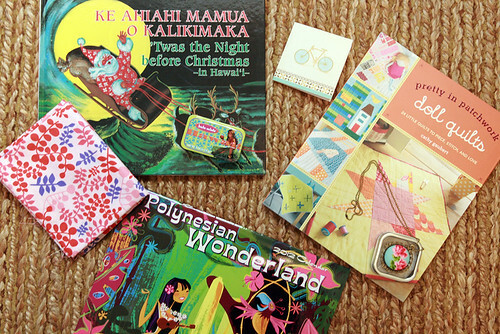 You can probably imagine my joy at seeing a package at my door from Hawaii and knowing it must be from Amber. I really enjoyed the swap, I definitely think I will be doing one again. 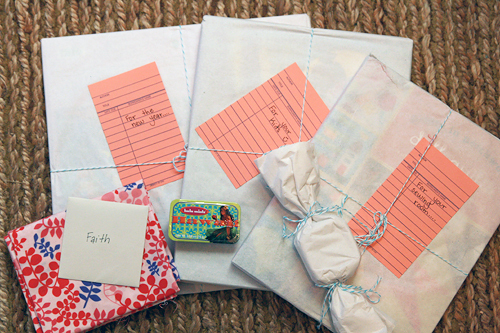 I think the best part was knowing that the recipient would be someone who would appreciate a handmade gift.